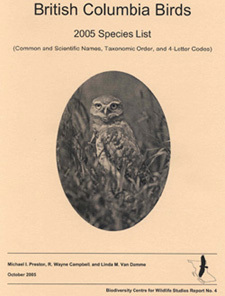 From time to time, the Biodiversity Centre for Wildlife Studies and the Wildlife Data Centre develop, or collaborate on, informative pamphlets and booklets that pertain to the conservation, preservation, and understanding of British Columbia wildlife and their habitats. The following items are currently available: prices (if applicable) appear below each item. To order publications by mail, please contact us.